The LORD said to Moses, “These are the appointed feasts of the LORD, the holy convocations, which you shall proclaim at the time appointed for them. In the first month, on the fourteenth day of the month in the evening, is the LORD’s passover. And on the fifteenth day of the same month is the feast of unleavened bread to the LORD; seven days you shall eat unleavened bread. On the first day you shall have a holy convocation; you shall do no laborious work. But you shall present an offering by fire to the LORD seven days; on the seventh day is a holy convocation; you shall do no laborious work.” And the LORD said to Moses, “Say to the people of Israel, When you come into the land which I give you and reap its harvest, you shall bring the sheaf of the first fruits of your harvest to the priest; and he shall wave the sheaf before the LORD, that you may find acceptance; on the morrow after the sabbath the priest shall wave it. “And you shall count from the morrow after the sabbath, from the day that you brought the sheaf of the wave offering; seven full weeks shall they be, counting fifty days to the morrow after the seventh sabbath; then you shall present a cereal offering of new grain to the LORD. “On the tenth day of this seventh month is the day of atonement; it shall be for you a time of holy convocation, and you shall afflict yourselves and present an offering by fire to the LORD. “Say to the people of Israel, On the fifteenth day of this seventh month and for seven days is the feast of booths to the LORD. On the first day shall be a holy convocation; you shall do no laborious work. Seven days you shall present offerings by fire to the LORD; on the eighth day you shall hold a holy convocation and present an offering by fire to the LORD; it is a solemn assembly; you shall do no laborious work. “These are the appointed feasts of the LORD, which you shall proclaim as times of holy convocation, for presenting to the LORD offerings by fire, burnt offerings and cereal offerings, sacrifices and drink offerings, each on its proper day. Raise a song, sound the timbrel, the sweet lyre with the harp. Blow the trumpet at the new moon, at the full moon, on our feast day. For it is a statute for Israel, an ordinance of the God of Jacob. He made it a decree in Joseph, when he went out over the land of Egypt. I hear a voice I had not known: There shall be no strange god among you; you shall not bow down to a foreign god. I am the LORD your God, who brought you up out of the land of Egypt. Open your mouth wide, and I will fill it. And coming to his own country he taught them in their synagogue, so that they were astonished, and said, “Where did this man get this wisdom and these mighty works? Is not this the carpenter’s son? Is not his mother called Mary? And are not his brothers James and Joseph and Simon and Judas? And are not all his sisters with us? Where then did this man get all this?” And they took offense at him. But Jesus said to them, “A prophet is not without honor except in his own country and in his own house.” And he did not do many mighty works there, because of their unbelief. The truth is, outside the grace of God and beyond the power of the Holy Spirit, none of us has any business—let alone authority—to share the truth of the faith with anyone. But the good news is that Jesus Christ wants us to share His love far and wide. By nature of our baptism, each of us has been commissioned—set apart, sent forth—to do just that! And so we dare, at times, to say what’s on our hearts despite the doubts in our heads and the skeptics in our lives. We send that encouraging email. We post that update about a Feast Day on Facebook. We pin that prayer on Pinterest. We have conversations that take all the courage we can muster and hope that the wisdom of God somehow shines through—not because of who we are—but because of who He is. And sometimes our attempts to bring love, joy, and peace to our little corner of the world seem to just . . . fall . . . flat. Now, the Devil would convince you that your attempts don’t matter: Who do you think you are, anyway? But they do matter, friend. Your attempts to share the light of Christ matter because God is at work even when we cannot see it and despite our own sinful nature, both past and present. Jesus didn’t let the critics keep Him down. He just shook the dust from His feet and continued to go about His Father’s work, and so should we. We must remember that even if our friends and family members don’t appear to be hearing us—maybe because of who we once were or who they perceive us to be now—we are still, through the power of the Holy Spirit, planting seeds of truth, of peace, and of love all the time. 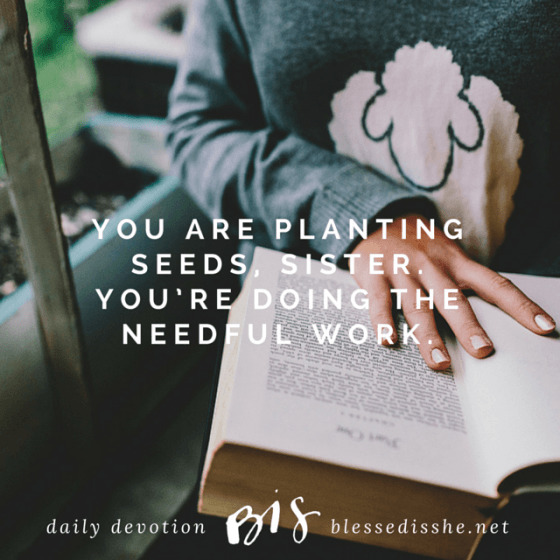 Perhaps someone else will water that seed, and still someone else will finally see the seed come to fruition, but you are planting them, sister. You’re doing the needful work. Through the power of the Holy Spirit, we’re planting seeds of truth + of love all the time. Today, let’s pray for the courage to continually plant seeds in the lives of those around us regardless of their response, and for other laborers in the vineyard to help those seeds grow. May we have eyes to see the mighty works that God is doing right in front of us. Heather Renshaw lives with her family in the Pacific NW. She’s a writer and uplifter on a mission to drink good coffee and sow good seeds despite her sinful past and present. You can learn more abut her here.